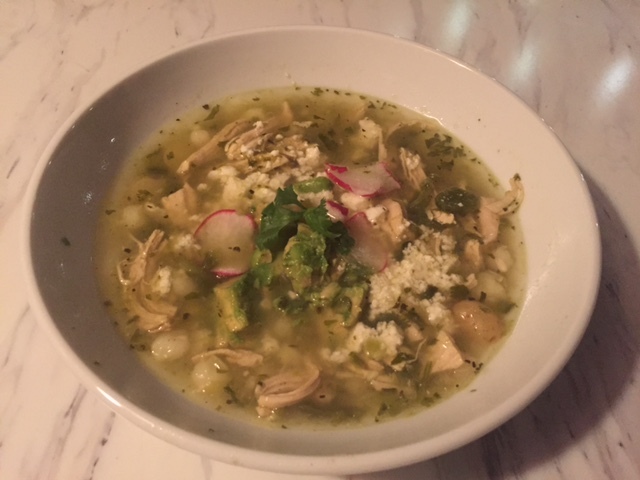 Soup is what’s for dinner, this chicken posole verde soup is one of our family’s new favorites! Hominy is found in the Mexican section of the grocery store and for those of you who are local, remember Tuesday’s at Fresh Market chicken breasts are $2.99/lb. Heat the olive oil in a heavy-bottomed stockpot over medium-high heat. Add the onions and garlic and cook until translucent. Stir in the cumin and then add the chicken stock and chicken. Add the potatoes and hominy and simmer until the potatoes are tender. Combine the poblanos, jalapenos, tomatillos, cilantro, oregano, garlic, in a blender. Blend on high until all of the ingredients are well combined. Add the blended mixture to the pot and cook for about 15 minutes. Season with salt and pepper, to taste. Ladle the posole into bowls and garnish each serving with avocado, thinly sliced radish, queso fresco, and chopped cilantro. Serves 8. « Finally Friday! This is what I’ll be making tonight while we watch our son’s hockey game, happy Friday everyone! I am on it. Thanks, Carol. Oh and don’t substitute the cotija cheese!